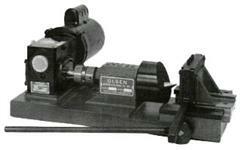 The Olsen Power Flare machine was designed and developed to provide a near perfect method of flaring brass, copper and steel (including stainless steel) tubing for pneumatic, hydraulic and fluid systems. Power Flare has been tested and accepted by a multitude of customers in the United States and overseas. Installations with pressures to 11,000 psi are operating without leaks! Power Flare is simple to operate. New personnel can operate the machine at close to maximum efficiency after only a brief break-in period. Operation is simple and requires little physical effort. No tools are needed. The unit is self contained whether as bench unit or with floor stand. Please email admin@trysurplus.com a list of the tube sizes you will be flaring and your zip code, and we will email you a quote including the cost of tooling you need and freight to your location.